Daft Punk + Guitars = Liberal Amounts Of Win. 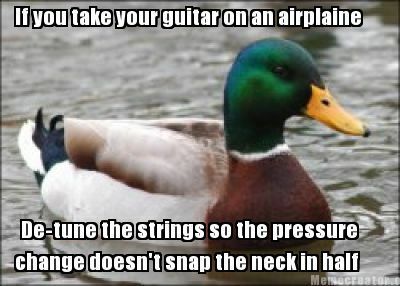 Critical Advice For Guitars on Planes From Actual Advice Mallard. Via Traditional Hard Robots, the fact that I’ve never encountered this piece of advice before. I played guitar when I was five years old and my parents would have obliterated me if it hadn’t survived a plane trip. Can Jack White buy billboard space in Times Square to transmit this information globally? Also, shout out to Actual Advice Mallard for always coming through.